Saint Lucia Day is a beloved tradition in Sweden. The original Lucia was a 3rd century Italian girl who wore a crown of candles and brought food to those who were persecuted. Another legend says that in Varmland, Sweden, where my family lives, Lucia brought food to the starving villagers at Lake Vanern. St. Lucia Day is December 13, which was previously Winter Solstice on the old Julian calendar. On this day, the eldest daughter dresses up and brings Lucia buns to her household, with younger siblings also in procession. The straw goat in these images is called a julbock, and many people in Sweden have these festive guys at Christmas time. 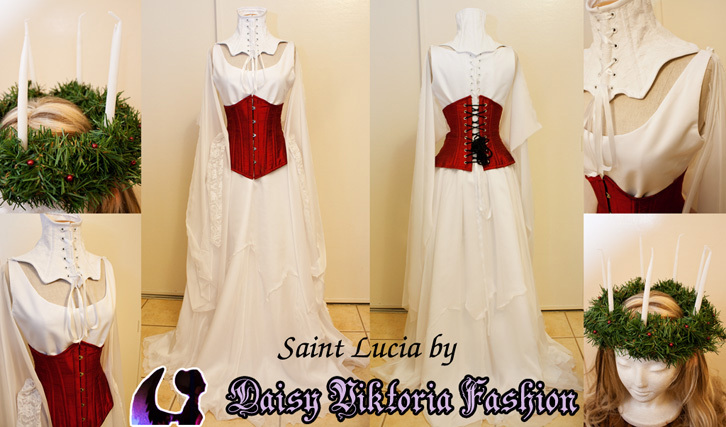 I chose to create a modern, updated version of the classic Saint Lucia dress, a white gown with a red sash, this one suitable for my own fashion aesthetic.